New York City is a magical place full of dreams and possibilities. It is also home to some of the most famous landmarks in the entire world. People flock from all over the wold, near and far, to visit the 33.7 square miles of Manhattan Island. Between the culture, the food and diverse population, Manhattan is a hub for everyone. If you’ve never been there, there are probably a million and one reasons why you should visit. If you have been, there is still something for you to see! The best part, you can win a trip for 4 to visit New York City, courtesy of Atlantic Luggage and Delta Vacations! Statue of Liberty & Ellis Island: A national symbol of political freedom, the Statue of Liberty and Ellis Island are must sees. Many of our ancestors walked through the doors or Ellis Island, it’s almost impossible not to FEEL your family lineage upon entering. Broadway: Visit one of the 39 theaters to see a New York original or a classic. Either way, it’s a must! Museums: Some of the most famous museums in the world are in New York City. Visit the MET, the Guggenheim or the American Museum of Natural History, to name a few. 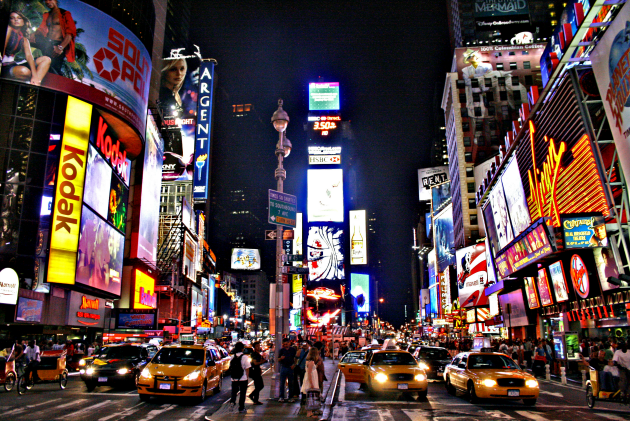 Times Square: From sidewalk performers to the bright lights of the city streets, Times Square does not stop! Rockefeller Center: This is a must see, especially during the holidays! Go ice skating and watch the lighting of the world famous Rockefeller Christmas Tree. Even if you grew up in NYC, there’s a good chance that you haven’t seen all that New York has to offer. Personally, I grew up right over the George Washington Bridge, in New Jersey. I have been to the city more times than I can count, but I know there is still an entire city out there left to explore. It is truly a place that everyone must visit at least once in their lifetime. Traveling to NYC can also be one of the most expensive trips of your lifetime. It’s a trip that is sure to add up, between hotels, airfare, entertainment and food. Winning a trip from Atlantic Luggage and Delta Vacations could be just what you need to make your dream trip to NYC come true! Atlantic Luggage company is a leader in affordable, lightweight luggage. Their inline-skate style wheels making maneuvering through the airport and into the city much easier. This is the perfect luggage for business or pleasure, allowing you to fit all of your trip essentials. Since NYC is the fashion capital of the world, packing for your trip might be intimidating. Try rolling your t-shirts and cotton dresses, and line the outer rims of your luggage with your shoes. Always wear your heaviest shoes or bulkiest clothes on the plane to help save that precious room in your luggage! Entering to win a trip to New York City is as easy as entering the Atlantic Luggage sweepstakes. All you have to do to Enter to win a family trip is head over to the sweepstakes form on the Atlantic Luggage website and fill out the entry form! You will then have a chance to win a trip for a family of four to New York City or San Diego. The sweepstakes runs from October 15th through November 15th and the grand prize includes airfare, accommodations, travel luggage and allowance money for activities for 4 people, valued at $3,700! Have you ever visited New York City?